Whomp whomp. There're no Dead Kennies for sale. Oh my god, we killed Kenny! South Park and Kidrobot kick off an awesome new collaboration . You know Kenny as the poor kid in the group, who eats canned food and frozen waffles for dinner and has died in innumerable ways in South Park’s first five seasons. Sculpted to look every bit the worst for wear, Dead Kenny features exposed brains, bloody ribs, authentic cuts, scratches, and scrapes, and an arm that falls off the bone. 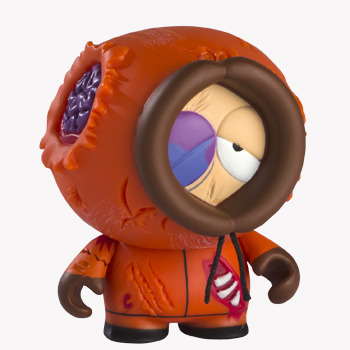 Sporting the seriously distressed look befitting a 4th grader who’s died a hell of a lot more than his fair share, Kenny is just the 9-year old to put South Park on the Kidrobot map. Highly detailed, colorful figure!!! Dead Kenny helps us remember the good ol days when Kenny died on south park.